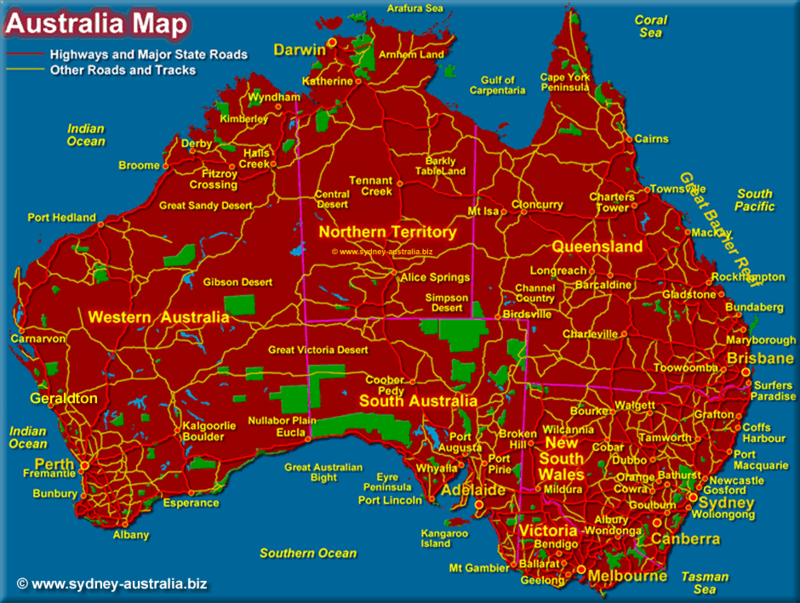 Tourist Map of Australia - showing states, national parks and reserves, highways and main roads, cities and towns. See more about Australia. The map shows the Australian Capital Territory, the states of Queensland, New South Wales, Victoria, South Australia, Western Australia and The Northern Territory. A map of Tasmania, just to the south, Tasmania. Highways are marked in red, while other roads and tracks are marked in brown. The National Parks and National Reserves are shown in green with major lakes (some dry) shown in blue. Deserts shown on the map are the Gibson, the Simpson Desert, the Great Sandy Desert and the Nullarbor Plains. New South Wales accommodation includes hotels, motels, luxury resorts, caravan parks, camping, bed and breakfasts, backpackers and youth hostels. For Hotels and other accomodation, see Australia Hotels.